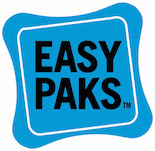 Easy Paks® are simple to use pre-measured water-soluble packets. No measuring, no guessing and no waste. Easy Paks® Cleaners work on a wide variety of surfaces to make cleaning easy and effective. Concentrated powdered compound quickly dissolves in water to produce a cleaning dilution that can be varied to meet your needs.